Lori Ziganto, a homeschooling mom who writes for Big Government, wrote a review of President Obama's speech, complaining that the president was giving too much details on the future troop withdrawal and that Obama's comments on "nation-building here at home" was way out of line because America has been a nation has already been "built." In the first paragraph, she complains that Obama is ignoring military commanders by reducing troop levels by too much, and then points to Obama's initial surge, which was less then what military commanders advised. Even though Obama's troop surge of 30,000 troops has been a success, do you want to know what military commander advised more troops? 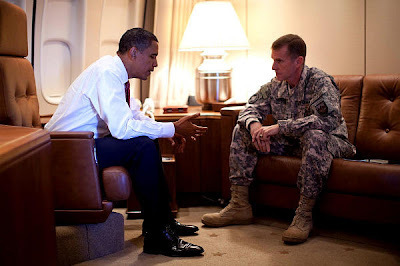 It was General McChrystal, who wanted.the troop surge. It was also McChrystal who complained about the administration in an interview published by Rolling Stone, but it seems Ziganto is only upset when the president talks about military actions publicly. Ziganto then goes on to complain that Obama wanting to focus on America. "Our nation was already built and we like it," she wrote, but Ziganto must live in a fantasy land. America's infrastructure is crumbling and lacks modern mass transit, like a high-speed rail that conservatives like Ziganto fought against. Our education system is inadequate, health care is far from affordable, and we continue to rely on foreign energy supplies - again, conservatives like Ziganto have no interest in "nation-building" at home and investing in newer technology that would help us rely less on foreign nations. Ziganto also complained about the reintegration of the Taliban in Afghanistan. She makes it sound as if this idea just popped into the president's head, but how exactly do you think this concept came to be? Those very same experts and military commanders Zigato complains that the president isn't listening to came up with this strategy - General McChrystal believed the the Taliban should play an active role in the political process. Basically, Ziganto is another one of those ignorant conservatives who believe the president and anything he does is bad, justifying her hypocrisy. What is even sadder is that Ziganto is homeschooling her daughter creating a second generation of ignorance. Did Andrew Breitbart Extort Rep. Anthony Weiner? Ignorant Right Wingers On Planned Parenthood!